who will actually be doing the work on their jewelry. for them, using their old gold at a fraction of the price. To do the type of intricate reconstruction of jewelry most stores will not take in. From the simplest chain repair, to the most delicate antique restoration, Expert Jewelry Repair & Design is proud to feature goldsmiths Jenna and Randy, who can perform these repairs, restorations and more. When you come into Expert Jewelry Repair & Design, dress casually because that is how we run our store. Comfortable without any high pressure sales people. If you want glitz and glamour then go to the Mall and have a good time. But, if you want to have a fun relaxing jewelry experience come in and see us. See our display of "How a ring is made...from start to finish" or just stop in to say hi. A single accent piece of jewelry can really change up your look. 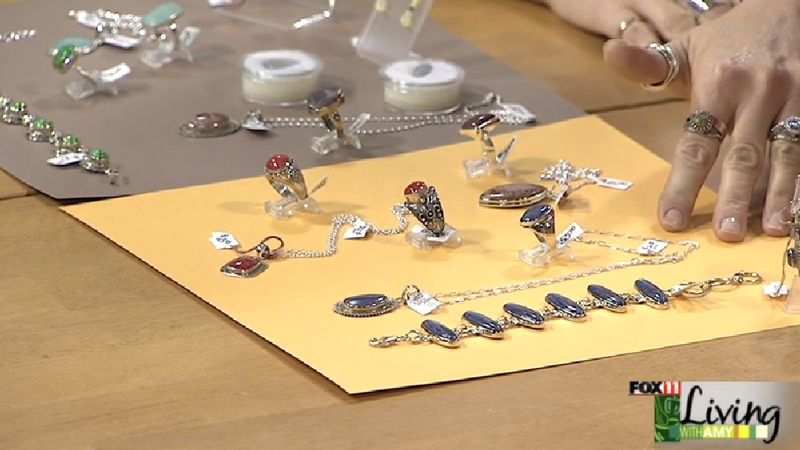 Kim from Expert Jewelry Repair and Design shows some unique pieces they have. See the video from Kim's visit to Fox 11's Living with Amy. Michael Rivero lives in Oahu, Hawaii, with a view of Pearl Harbor, and does visual effects for commercials, movies and TV shows, including “Lost.” When he wanted to make a custom lapel pin for his production company, he searched the Internet and found Expert Jewelry Repair & Design, a store that could do the job. It was in Appleton, Wisconsin. The microscopically small jewelry store at 636 W. College Ave. is one many Appleton residents probably pass by without a second thought as they cross the train tracks at Richmond Street. But the shop has gotten a fair amount of national and international attention and orders. It’s all due to its unusual jewelercam, a live camera that shows two master bench jewelers making and repairing jewelry, and the Internet savvy of its owner who knows how to keep the site on the top of the browsers. The shop Expert Jewelry Repair & Design isn’t a typical jewelry store. It’s more funky than showy with its recycled Balinese teak wood showcases and a window that peeks into the jewelers’ tiny, crowded workroom. Its jewelry is far from a carbon copy of mall store baubles. Instead, it’s world-savvy, multicultural and one-of-a-kind pieces gathered for the store by a global traveler. The shop itself is no more than 900 square feet, about 20 feet away from the railroad tracks. When trains rumble past, jewelers put down their torches and tools until the vibrations have stopped. With two master bench jewelers on staff — Elizabeth Stephenson and Bridget Pahnke — the store can manufacture jewelry according to the customer’s specifications. It has done work in 14- and 24-karat gold and sterling silver. It also does repairs on gold and silver heirloom pieces as well as costume jewelry. When Kester took over the operation three years ago from retiring Gary Stein, he decided to put in the jewelercam and Web site for the novelty value. Kester was a tech geek who loved fiddling. “It stems from my interest in computers. I did Web conferencing with a girlfriend and I thought doing the jewelercam would be unique,” he said. With a simple $7-a-month Web site and a $100 camera the size of a pack of cigarettes, he set up a site that showed jewelry making in action. A still image recycles every five seconds. He thought about using streaming video, but decided against it because dial-up users couldn’t access it easily. Besides those who like the novelty, the site has proven practical. A far-away customer can see his own piece in the works. “I thought it would be a gimmick, but it’s been a useful tool,” he said. “Liz can hold a piece up and say, ‘Did you want the stone here?’ The customer can see it and say, ‘No, that’s not right,’ or, ‘Yes, that’s what I had in mind. '” A school in California even recommended students watch the jewelercam to see what bench work looks like. Most queries have been national and a few have been from foreign countries. “I put up some coffee bean earrings on my Web page and forgot about it. Some guy from Germany saw it and he was meeting with a CEO of a coffee company. He paid more for the shipping than the earrings,” Kester said. “I had an order of 20 coat-of-arms Dracula rings for someone who had a connection to the Christopher Lee fan club in England.” A church in Redlands, Calif., saw the site and asked Kester to cast sterling silver and gold pins. It was a $1,500 order. Caltech, also in California, had the shop make 4,000 pins for donors to a fundraising campaign. It was all through the Web. While the jewlercam has gotten a lot of attention, Kester said that actually just 6 percent of his volume comes from the site. About 44 percent is from the trade, meaning repair work sent over from other jewelry stores. A full 50 percent is work for individuals, mostly local. Charlene Landskron, for example, is a local gemologist working as a business analyst for Jewelers Mutual in Neenah. She’s brought in her own custom work and recommended the shop to others because of the quality. “They don’t have to send it out. They can custom make something and you can check on it with them as they’re making it,” she said. “A lot of retail operations can’t get special things in for you.” She has not gone through the store’s Web site. A Chilton resident, Daniel Weiland, however, was one local customer who wouldn’t have found the store without the Internet. “I was looking for a custom jewelry designer in Appleton a month and a half ago. He was on the top of the list,” Weiland said. He and his fiancee wanted to create a custom wedding band with dolphins. They picked it up last Saturday. “It’s just beautiful,” Weiland said. The local customers range from businesses to parents who want a custom class ring for their children to grandmothers who want to craft family heirlooms to pass down. Because of its presence on the Web, Expert gets orders and requests from all over the world. A German businessman caught sight of some earrings that Expert had produced for a local café, and ordered several pairs for the wives of his clients. A California woman sent a picture of a single earring, hoping (and discovering) that Expert could duplicate its lost mate so that her husband wouldn’t know the difference. One of Expert’s bench jewelers even gets the occasional marriage proposal via e-mail.